We're focussing on using the paid-for Elastic Deployments rather than our free sandboxes because the technique used by Meteor to get good performance from MongoDB doesn't work with our sandboxes. Then click "Add Deployment" in the bottom right of the form and the Compose system will go and deploy a multi-node, autoscaling MongoDB database for you. Once that's created, you should see the database's Collections view. Click on the Admin tab to see the various administration tools. The first thing you'll see is the overview which includes information about how to connect to your database. Click the lower 'Add user' button and Compose will add that user for you. We now have everything we need to move onto the next step in the tutorial. Step 3: Storing tasks in a collection – You will be able to complete the first part of this step with no problem, but for the second part, "Inserting tasks from the console", you'll have to deviate from the tutorial slightly. This is because the tutorial suggests you use the meteor mongo command to connect to your MongoDB. 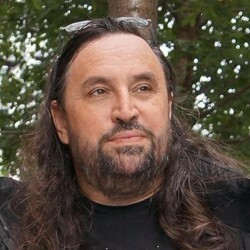 The problem is that that command only works with local or Meteor-deployed instances of MongoDB. 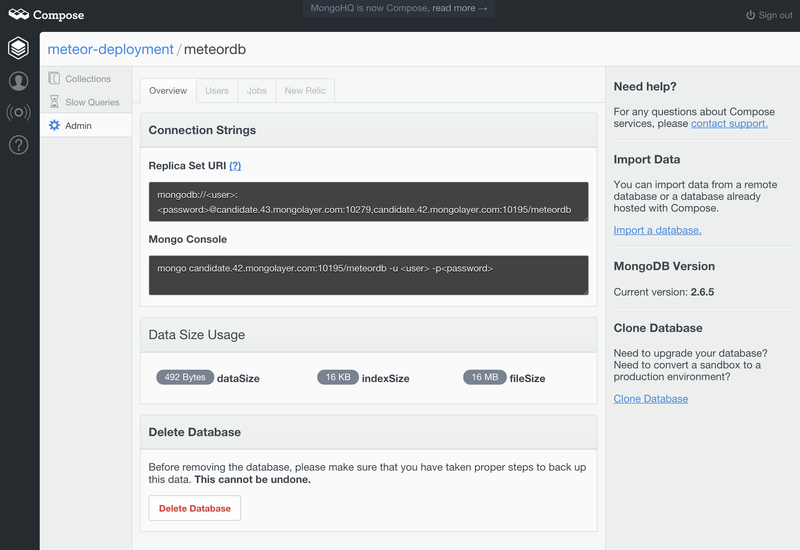 It's a bit of an oversight, and it means you'll have to install the Mongo shell on your system to connect up and to do that, you'll need to usually need the rest of MongoDB with it. You'll get a Mongo shell prompt and you can now continue the tutorial and insert some tasks using the command line (and be impressed by how quickly the web browser updates when you insert a records into the database). You can now work through step 4 (Adding tasks with a form) and step 5 (Checking off and deleting tasks). Step 6: Deploying your app - The good news is that what is in this step works. Your application will be deployed up to a meteor.com sub-domain for testing. The bad news is that it won't connect to your Compose database because the testing system doesn't support external databases. You'll be able to deploy and enjoy, but you'll have to select some other deployment route, be it your own server or a hosted cloud instance, to run your app on the Internet. The instructions for step 7, running your app on Android or iOS, will also work apart from where it suggests you point the mobile app to the server you haven't deployed. The final four steps, 8, 9, 10 and 11, need no intervention and you can work through them without changes. That'll bring you to the closing step 12 which directs you onto some of the other examples available and onwards to creating your own applications using Meteor. The additional steps that we have introduced here won't make any meaningful difference to how well the examples run until you start running a second Meteor server and get that talking to the MongoDB database too. 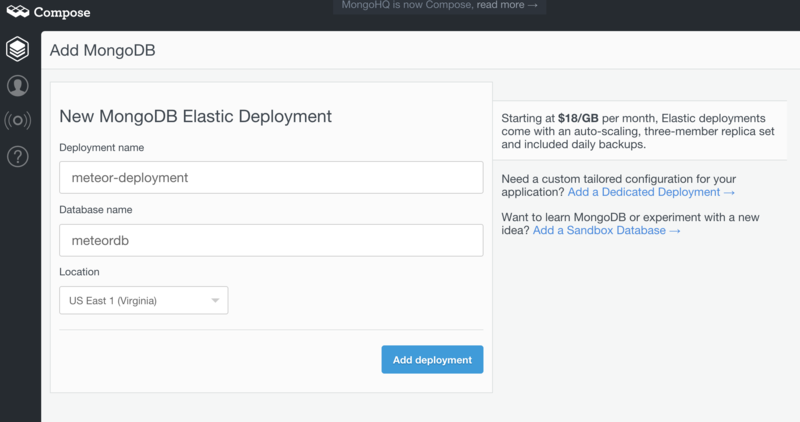 By applying those changes from the start though you'll be ready to scale up from day one, just like Compose's Elastic Deployments of MongoDB already do.